Biomass fuel industry has accelerated the develop speed of biomass stoves and steam boilers, AGICO is a leading steam generator manufacturer and supplier in China, for decades, it has focused on the researches of combustion characteristics of biomass solid briquette fuel, and the high efficiency small steam generator is manufactured for the new need from customers. Thanks to the R & D department of AGICO, microcomputer chip is integrated into this steam generator so that it runs safely and automatically, the labor cost is saved. When it encounters a abnormal situation, it stops running immediately and the fault code is shown on the screen. Daily inspection and maintenance are very easy and time saving. The pressure controller, safety valve and other important parts used on this steam generator have high stability. Multiple protective device such as low-level water, overpressure, thermal protection to make sure the safety of the steam generator. The steam boiler is also named small steam generator, it is composed of boiler and auxiliary equipment. Part of this boiler adopted the vertical structure. The special steam generator design has the following features: compact structure, less space required, silent working mode, larger heating area, high heat efficiency, strong stability, easy to install and move, either soft or hard pipe could work on it. G series small steam boiler has the advantages of Safe, high efficient, energy-saving & environmental protecting. Biomass steam boiler generates the same effect steam as general steam boiler does. It is the perfect alternative to electric boiler, oil boiler, coal boiler, gas steam generator. The security system can make sure it runs safely, reliably, and efficiently. This boiler adopted three-level protection with safety valve, one-way valve and exhaust valve which are all made of high strength copper alloy. User's security is enhanced with adding gauge glasses tube protecting device. There is no smoke and ash while burning. 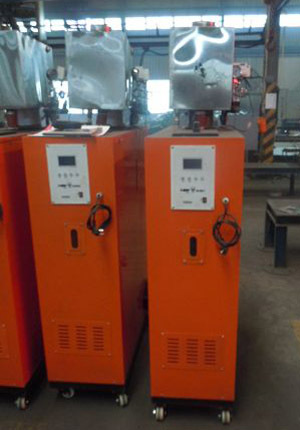 Low cost to run this type of Biomass steam generator. It saves 10% expenses than coal boiler, 60% expenses than gas boiler and electric boiler and 70% expenses than oil boiler. 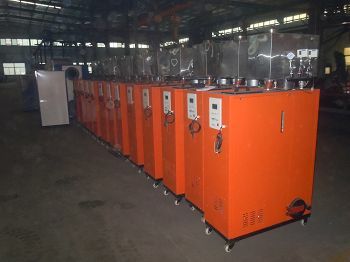 This is a kind of small biomass steam generator which burns high quality wood pellet. Biomass steam generator can be widely used in garment factories, hotels, bean products factory, canteens, dry cleaners, restaurants, mines and other places. It is also used in health care, bio - pharmaceutical industry, food industry and other places as sterilize apparatus and other purposes.